Henry Nkobi (blue shirt) scores Peterborough Sports' third goal against Aylesbury. Photo: James Richardson. If second-placed Brosmgrove Sporting had lost their home match with Cambridge City, the city side would have been unassailable at the top of Division One Central of the Evo Stik Southern League. Josh McCammon (blue) scores Peterborough Sports' second goal against Aylesbury. Photo: James Richardson. But Bromsgrove won 1-0 leaving Sports needing a maximum of three points from their final three games. They are next in action at a much-improved Kidlington next Saturday (April 20) before Cambridge City visit Lincoln Road on Easter Monday. The hosts did not improve much in the second half, but when Josh McCammon forced home at the secondnd attempt on 59 minutes, the Turbines had some breathing space. Debutant development team centre half Henry Nkobi then finished smartly on the turn with nine minutes to go, but the Turbines day was somewhat summed up by conceding a goal from their own corner once again late on that allowed Tre Mitford to poke home. 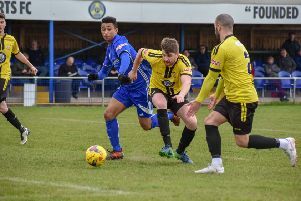 Yaxley ensurde their own safety while condemning Dunstable Town to a relegation battle by finishing strongly to pinch a 2-1 win. Dan Lawlor's penalty gives Peterborough Sports the lead over Aylesbury. Photo: James Richardson. The hosts led at the break before Liam Hook equalisedc midway through the second-half and Charley Sanders found an 86th-minute winner for the mid-table Cuckoos. Spalding United and Wisbech Town are still deep in relegation trouble in the Senior East Division of the Northern League. The former could drop into the bottom two if Carlton win their game in hand at Loughborough Dynamo on Tuesday (April 16). Loughborough scored twice early on to seal a 2-0 win at Spalding today, while Wisbech were losing heavily 4-1 at Lincoln United. A Dylan Edge goal did briefly give the Fenmen hope after conceding a 2-0 interval lead, but the home side forged clear again. Wisbech and Spalding fill the two places above the drop zone. They are both two points clear of Carlton who drew today. Stamford’s season is fizzling out. They led through a Joe Burgess goal against Belper at the Zeeco Stadium today, but conceded twice in the final 15 minutes to lose 2-1 in front of a crowd of 270. Ollie Brown-Hill saw a Stamford penalty superbly saved at 1-0 up. East Division: Lincoln Utd 4, Wisbech Town 1 (Edge); Spalding Utd 0, Loughborough Dynamo 2; Stamford 1 (Burgess), Belper Town 2. Division One Central: Dunstable Town 1, Yaxley 2 (Hook, Sanders); Peterborough Sports 3 (Lawlor, McCammon, Nkobi), Aylesbury Utd 1.